The artist who captured the iconic image of Harvey Milk used in the Forever stamp was photographer Dan Nicoletta, and we wanted to share with you this brilliant commentary of his, which he posted on the Youtube page of the trailer for AUTHOR. 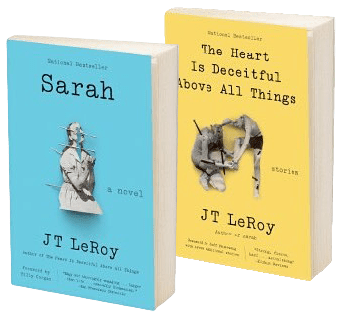 Many questions are brought forth with the unfolding saga of the JT LeRoy novels, so of course I was anxious to see this film from author Laura Albert’s perspective – now several years after some of the dust has settled on the original media frenzy revealing her to be the stealth author behind the LeRoy novels. Kudos to Jeff Feuerzeig for making the film and getting Laura Albert and other primary sources to trust him enough to share their intimate details. For those of us that have followed the trajectory of JT LeRoy, the film does not disappoint, it is revelatory and at times deeply poignant and touching and beautifully crafted. For me the take away of the film and the whole phenomenon begs the question – why the often irrational randomness in how and when and why we apply ethics in the art world. Isn’t the absence of a set standard one of the salient points of making art? Why for example are William Burroughs outlaw cultural riffs endlessly celebrated ad nauseum, but when a woman like Laura Albert crosses the gender line and takes on the culturally charged persona of a male youth at risk, she is persistently demonized for her inventiveness. And so through this documentary film we finally get confirmation of the piece to the puzzle that many of us suspected all along through the course of the public witch hunt that occurred after the reveal of Albert’s part in things. Turns out the source of the narrative was actually telling her story after all, that she had authentically lived a parallel track to her avatar JT LeRoy including but not limited to surviving molestation, abandonment and disassociation and addiction. She was in fact a youth at risk herself. This film affirms that we originally responded empathetically to the work because its authenticity was not very far away despite its fictional sheath and the media circus that grew up around its success. The film is refreshingly pro-neurodiversity and a welcome voice at a time when counter culture seems almost crusty or worse – fickle in its propensity towards call out culture… and often for not very good or rational reasons.